We've updated the developer guide to include the more advanced Custom Search features, such as synonym expansion and integration with Subscribed Links. These features let you trick out your search engine and give your users a richer search experience. Synonym expansion lets you expand a user's search term (such as "running") to include its variants (such as "jogging" and "sprinting"), so users will not need to search for each variant. Subscribed Links enables you to directly answer your users' questions by promoting a specific result at the top of the results page. 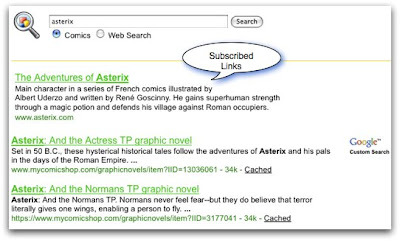 You can create your own result text and define sets of queries that would trigger subscribed link results. The developer guide may not be edge-of-your-seat material, but it does now come with a freebie glossary and a search gadget that you can add to your iGoogle page. We're still tinkering with the documentation and bulking it up with more juicy tips, so keep coming back to check our progress.